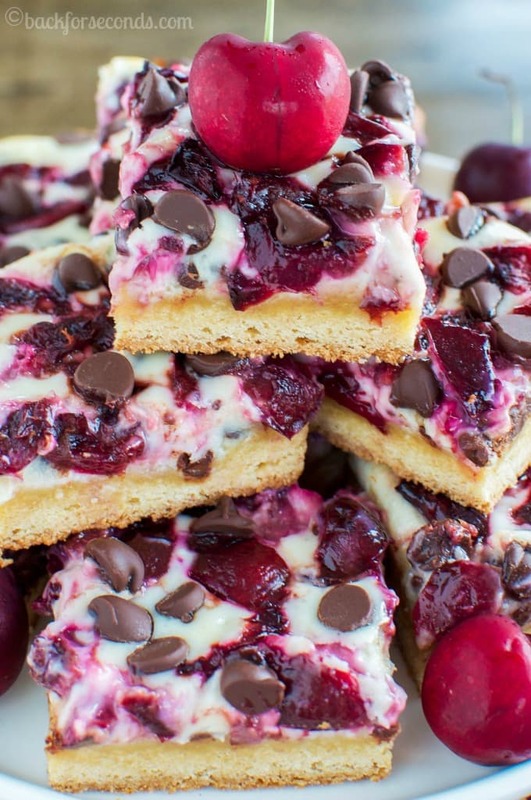 Cherry Chocolate Chip Cheesecake Blondies are the ultimate easy dessert! 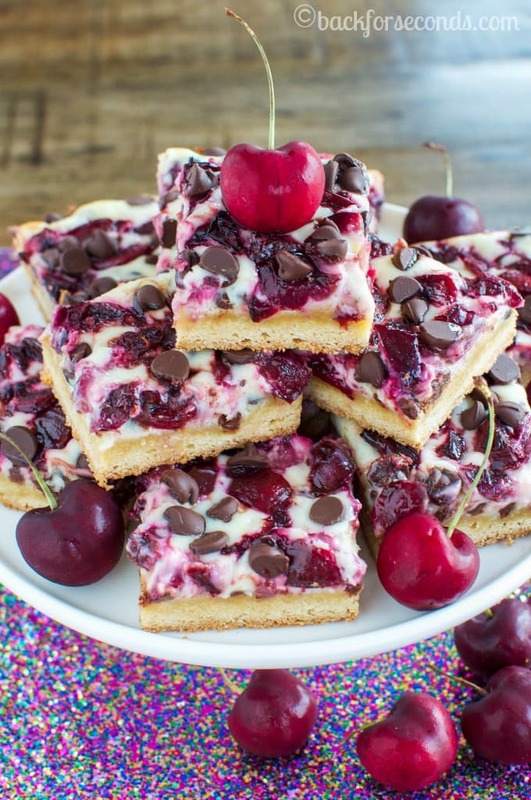 Chewy blondie, creamy cheesecake, fresh cherries, and chocolate – a dreamy combo! 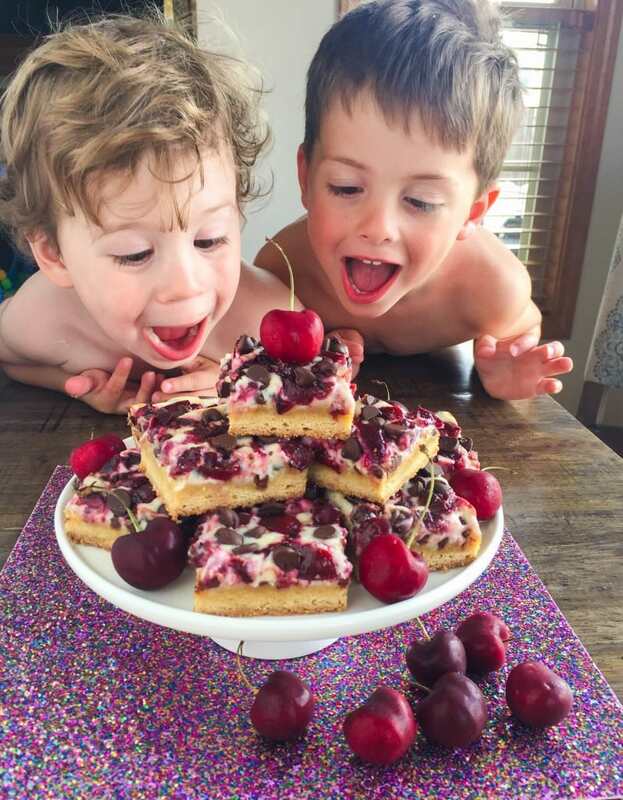 It’s cherry season and that means we are buying them every time we go grocery shopping. And since I have a bit of a baking obsession, we all knew some would end up in some treats around here. You guys, you have to make these this summer! They are the perfect easy summertime dessert that is sure to impress! 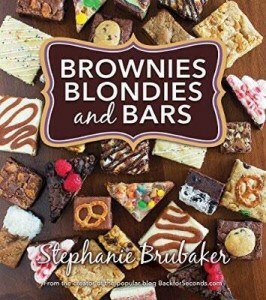 You all know about my Brownies, Blondies, and Bars obsession, right? Even after writing my cookbook, I still can’t stop creating more bar recipes! It’s just so much faster to make desserts in a 9×13″ pan, am I right? And all the layers, colors, and flavors in these cheesecake bars are so impressive, you could serve them for any occasion! I just have to share this picture with you all. Every time I take photos for this blog, all 5 of my little ones are eagerly waiting next to me asking if I’m done yet so they can eat. Ok, so the baby mostly just wants me, but the others are desperate for a treat. These two kept sneaking in my shots – they just couldn’t wait! Needless to say, these were a BIG hit with my clan 🙂 Enjoy! 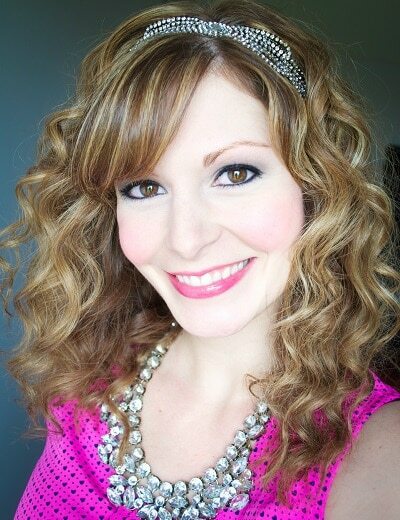 Ohmygawsh!! These just look amazingly rich and delicious- what a treat! The pix of your two little ones is just adorable! Oh my! Seriously, that IS the ultimate dessert. And their faces say it all!! Those photos are just gorgeous! I’m so in lobe with these cherries in these too! Gosh darn! Your family sure gets some wonderful sweets. Those two little ones are adorable. I am so into cherry season. These look super delicious, I can see why your little ones are going crazy for them, my 20 year old does the same thing. No wonder you can stay so trim and make all these goodies, your boys must devour desserts before you even get any!!! They looks so pretty too! That pic of your kiddos is the CUTEST!!! 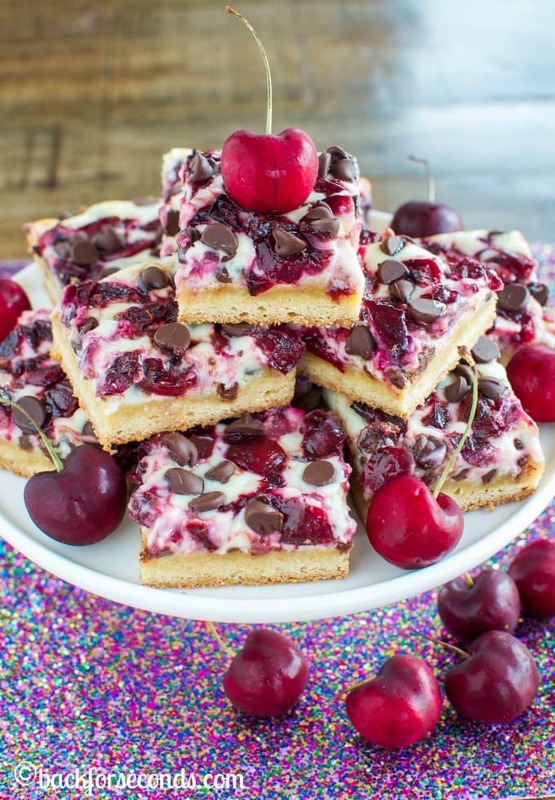 And I love these bars… gimme all the cherries… allllllllllllll summer long! had fresh cherries and didn’t know what to do with them; well besides eating them. I found your recipe and it had all the right elements. The cheesecake was the kicker for us. Thank you for sharing this recipe.